Two boys have been arrested on suspicion of attempted murder after a teenager was stabbed multiple times. 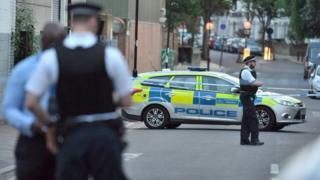 A 14-year-old boy is in hospital in a serious but stable condition after the attack in Fairbridge Road near Archway, north London, on Sunday. Two boys, aged 14 and 15, were held at addresses in the north of the capital in the early hours of Monday. A boy, 11, earlier arrested on suspicion of attempted murder is no longer a suspect in the investigation. The Metropolitan Police said he was "de-arrested and released from custody". Police were called to the scene shortly before 19:00 BST on Sunday. The alleged victim was found suffering from a number of stab wounds and taken by air ambulance to an east London hospital.